Wonderful welcome at the von Siebenthals this (Sunday) evening in Oberdorf. 43 miles from Berne, glorious Swiss landscape and NO RAIN!! 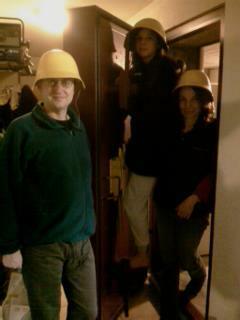 And if you were wondering what their bomb shelter in the basement looks like, here it is with Rolf, Karin and daughter Lena in bright yellow helmets. That door is nearly a foot thick, weighs in at least a ton, can withstand an earthquake or major explosion, and the bunker ceiling is also more than a foot of solid concrete. The neighbours would join Rolf and Karen here if it came to the worst. There wouldn't much room! 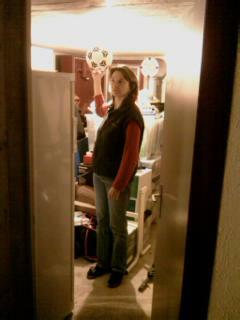 Karen is holding a football to shield the light from the camera. But think bicycles, skis, spare beds, school stuff and wine…..